ARGOSY Williams (USA) Montato, giocabile! Si! ATLANTIS Gottlieb (USA) Montato, giocabile! 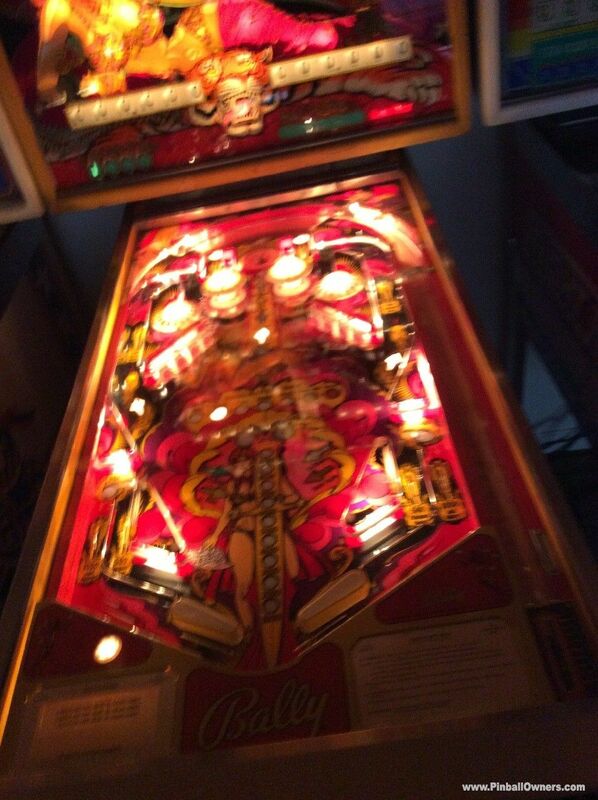 Mai Traded a Gottlieb Hit the Deck for this Atlantis. Recently installed a Ron Webb backglass. BIG SHOT Gottlieb (USA) Montato, giocabile! Mai Purchased from a friend, outstanding condition. BUCKAROO Gottlieb (USA) Montato, giocabile! Mai Repainted cabinet to original. Very nice. CAPT. FANTASTIC AND THE BROWN DIRT COWBOY Bally (USA) Montato, giocabile! Mai NOS playfield. Over the Top, no star backglass. Just got the cabinet back from NJ. Competently resprayed back to original except for the inside top rails. These were curiously untouched. A bit disappointing, but the restoration will carry on inspite of this glaring cosmetic flaw. CENTRAL PARK Gottlieb (USA) Montato, giocabile! Mai I repainted the cabinet to original. 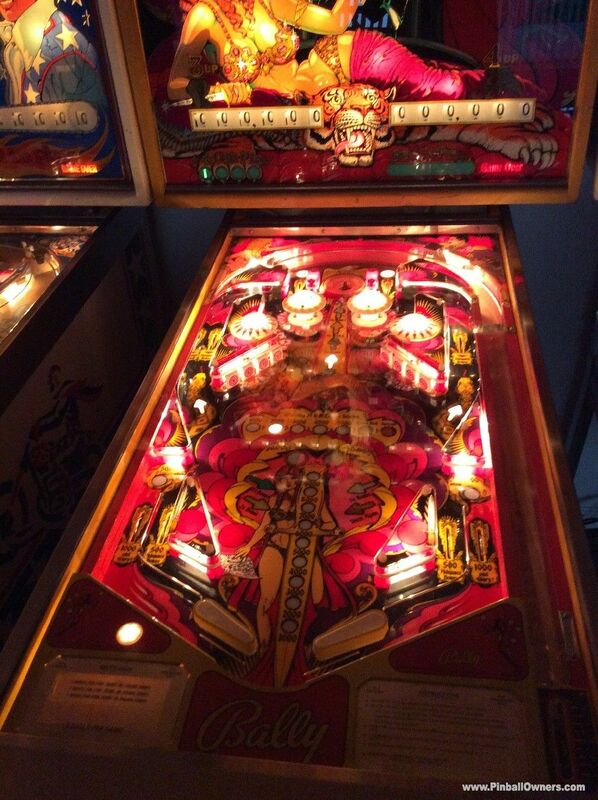 Quite nice playfield and backglass. 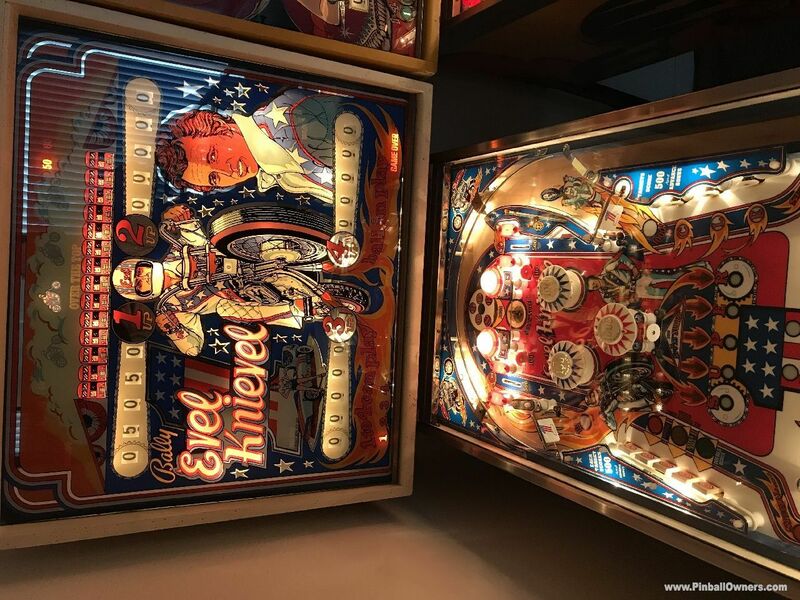 EVEL KNIEVEL Bally (USA) Smontato, in attesa di restauro Mai EM version, should clean up very nicely, have NOS playfield and plastics I have not yet installed. Recently converted back to US voltage and started and ran first time I tried with new US transformer. UPDATE. NOS Playfield not installed. Classic Playfields version installed on expert advice instead. Hard to argue with the results. 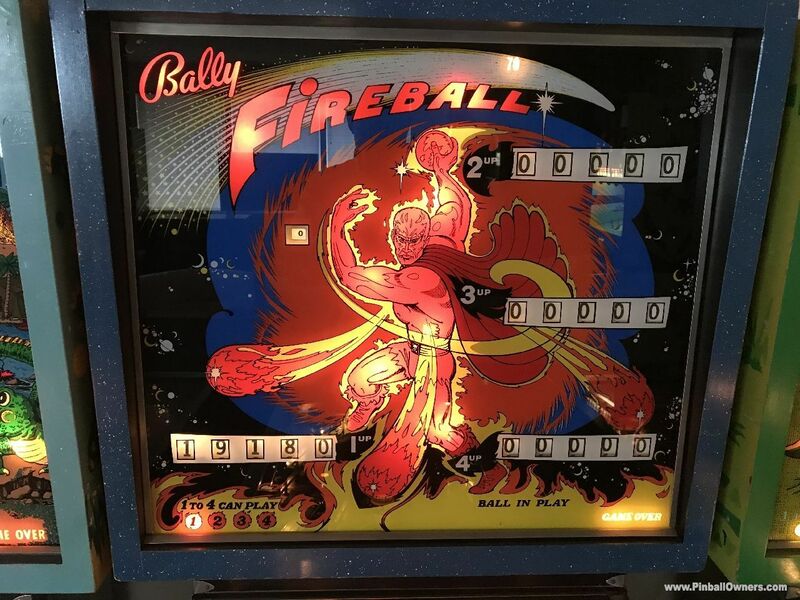 FIREBALL Bally (USA) Montato, giocabile! Mai Looked at many before I bought this one out of Nebraska. Quite nice. FLYING CARPET Gottlieb (USA) Montato, giocabile! 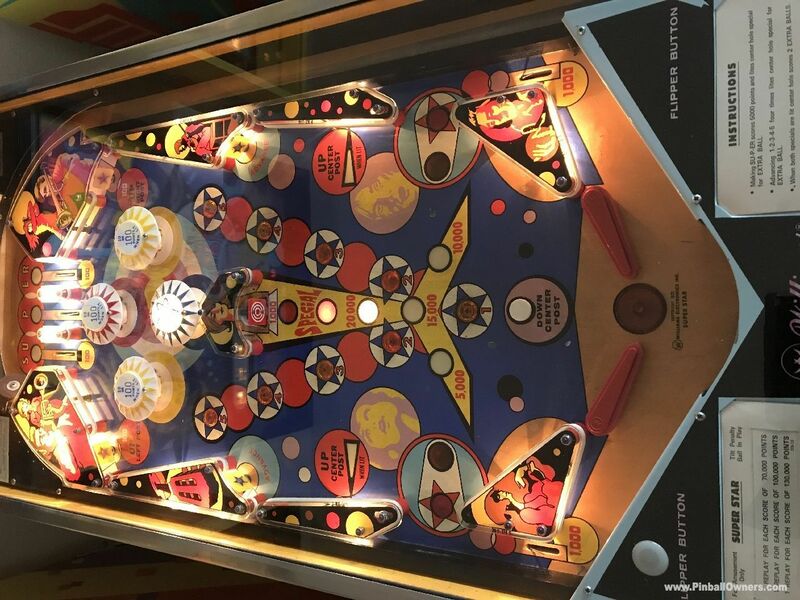 Mai Best original playfield. I really should repaint the cabinet. FOUR MILLION B.C. Bally (USA) Montato, giocabile! 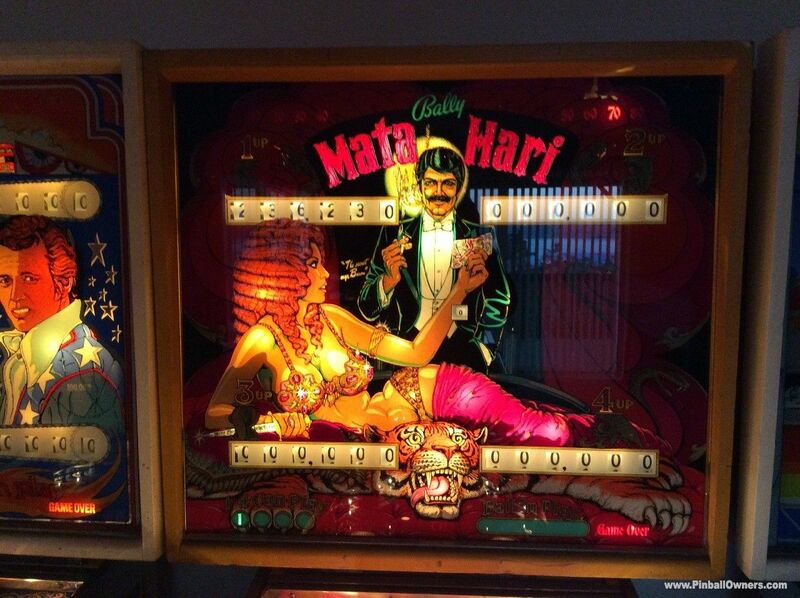 Mai Mint backglass with quite nice playfield and cabinet. HOT TIP EM Williams (USA) Montato, giocabile! Mai EM version. NOS back glass. I Wrecked Playfield trying to restore it with Magic Eraser. Have since learned how to use Magic Eraser. 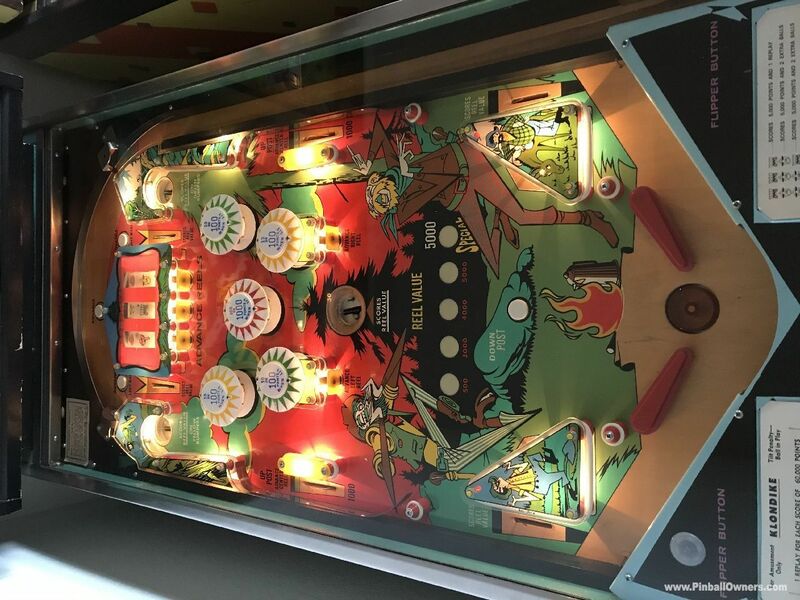 Pretty good used Playfield ready to install. JOKER POKER Gottlieb (USA) Montato, giocabile! Mai EM Joker Poker. Originally chime delete to France. Thanks to Mike in Europe to help install and get running a new set of his chimes. Awesome! JUMPING JACK Gottlieb (USA) Montato, giocabile! Mai Herb Silvers backglass. 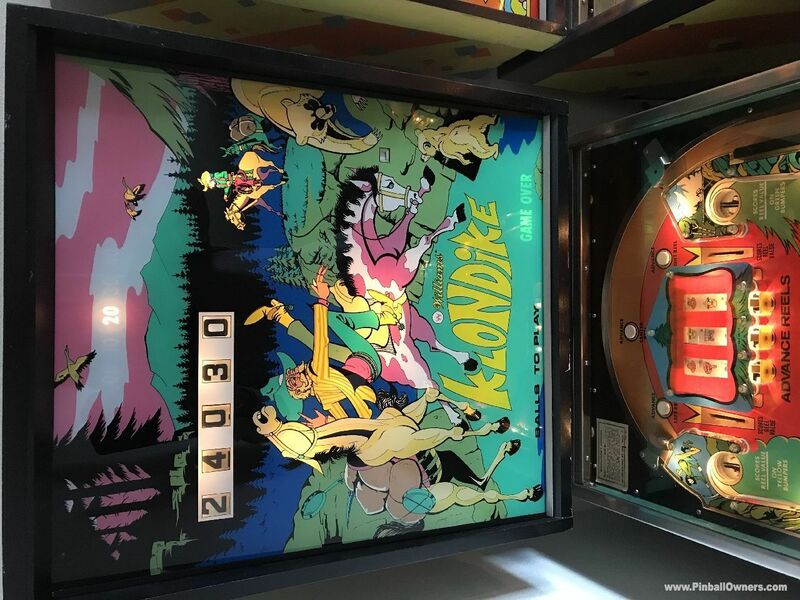 Nice playfield from a collector in Portland. Another cabinet I need to restore. KLONDIKE Williams (USA) Montato, giocabile! Mai Game HUO from new. 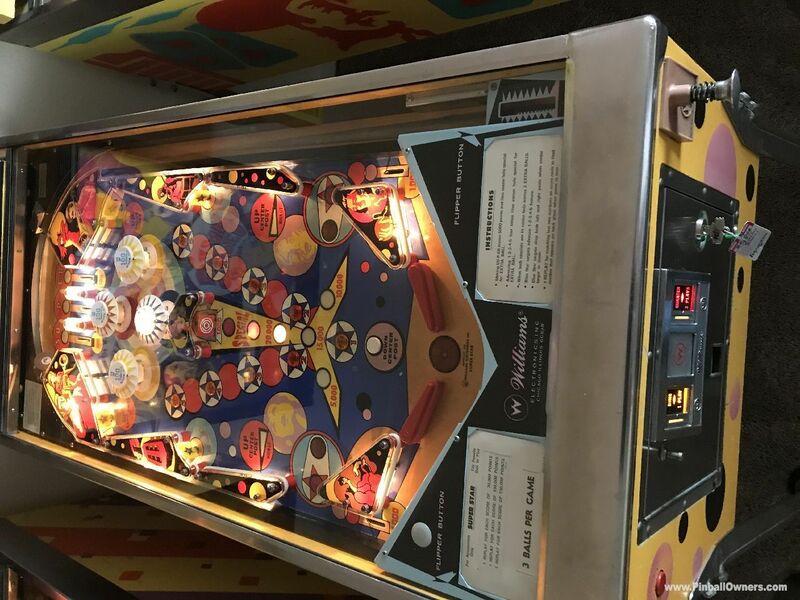 Must have died in 1973 judging by playfield wear. NOS backglass. LINE DRIVE Williams (USA) Montato, giocabile! Mai Herb Silvers backglass and plastics. Okay playfield. I repainted the cabinet to original. All solid-state sound effects still work. 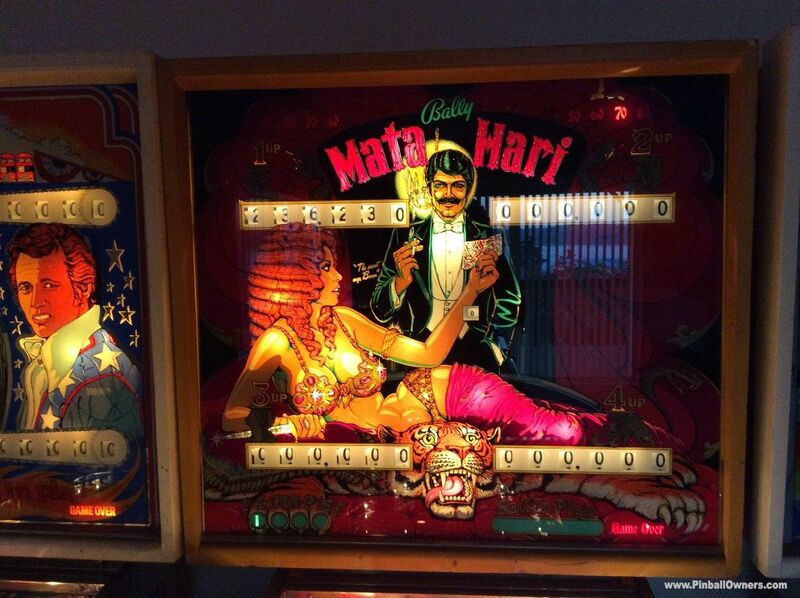 MATA HARI EM Bally (USA) Montato, giocabile! Mai EM version. 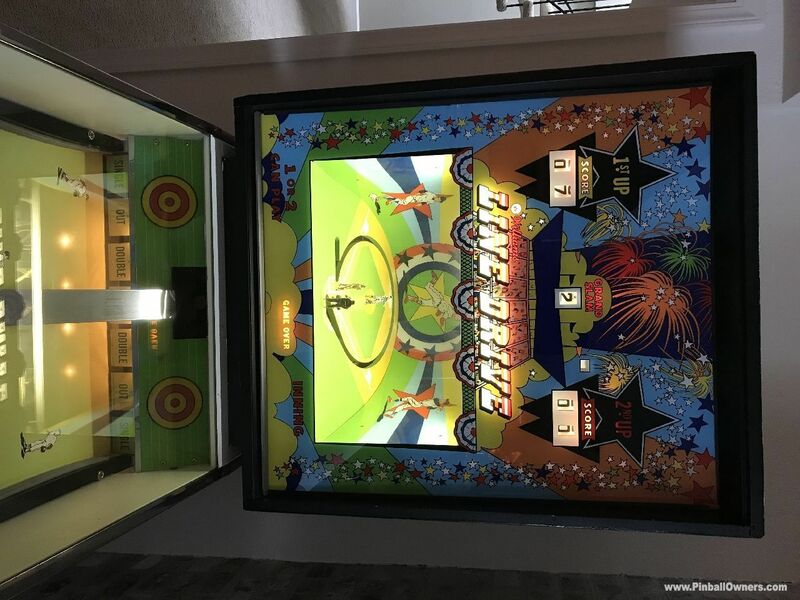 New playfield and backglass installed thanks to Tim. Looks like I'll ship the cabinet to Herb Silvers for a cabinet repaint. It will literally look brand new. MONTE CARLO Bally (USA) Montato, giocabile! Mai Mint backglass. 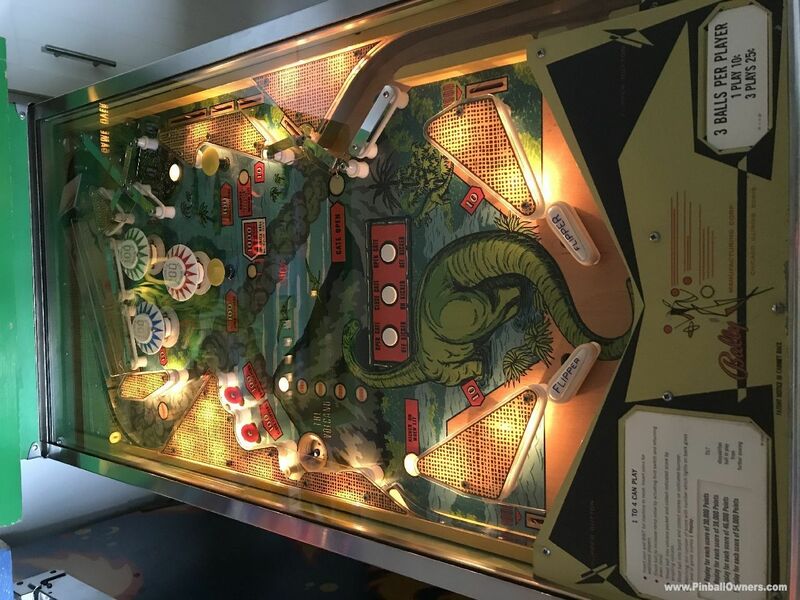 Could use a better playfield. 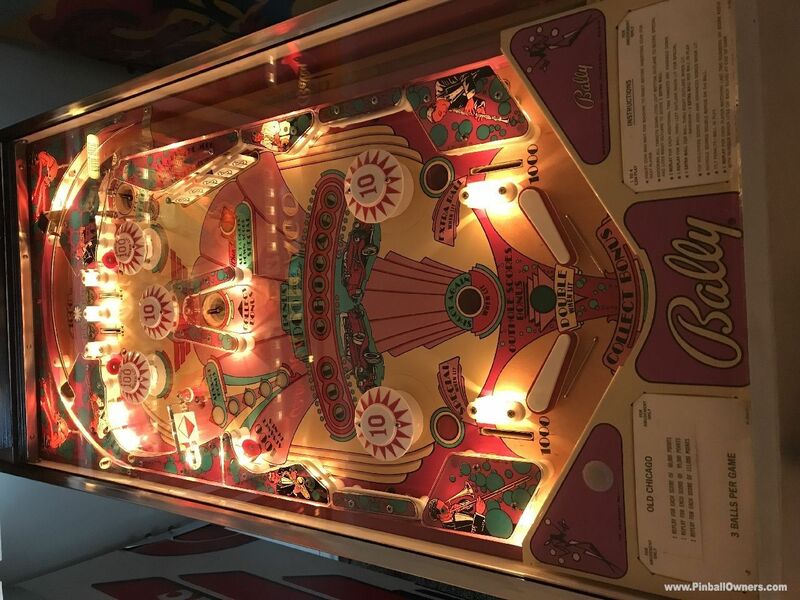 NIGHT RIDER EM Bally (USA) Montato, giocabile! Mai EM version. Cabinet repainted to original with mint backglass. Playfield planked so I bought NOS playfield, now installed. NIP-IT Bally (USA) Montato, giocabile! Mai Bought from a MN collector. I wish I could repay the favor. Quite nice. OFFICIAL BASEBALL Williams (USA) Montato, giocabile! Si! contattami Garage sale find here in Seattle. I repainted cabinet to original design. Also repainted every player, uniform, mitt, and baseball hat on the playfield. For sale locally, $2000.00. 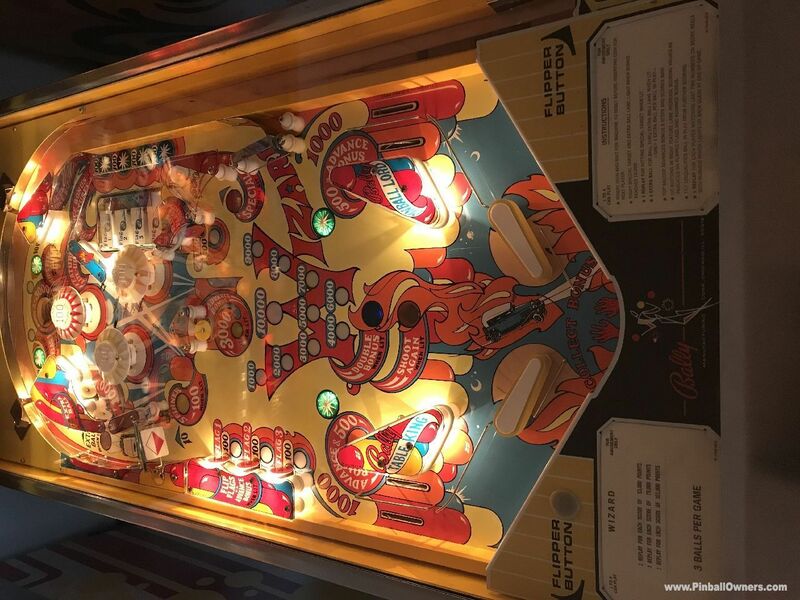 OLD CHICAGO Bally (USA) Montato, giocabile! Mai Bought when I lived in Idaho. 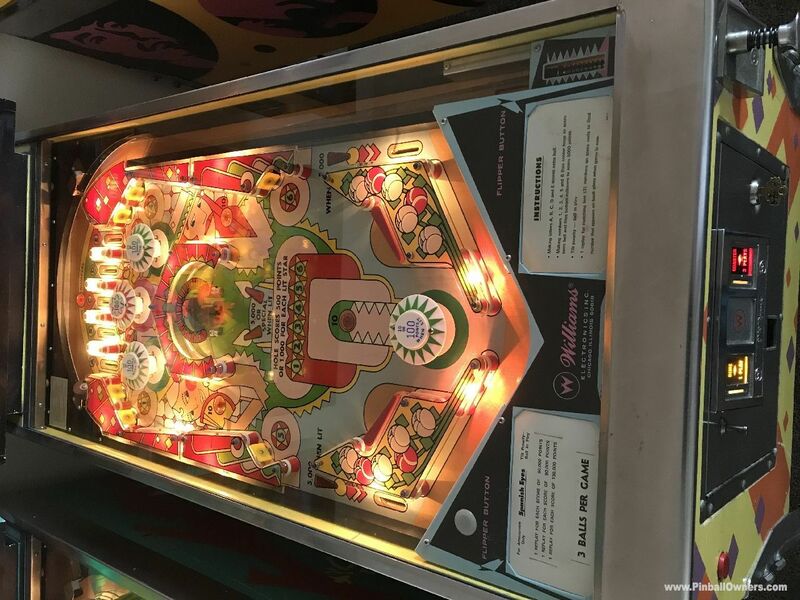 Backglass mint, playfield pretty close. Cabinet repainted back to original. PHANTOM Williams (USA) Montato, giocabile! Mai Rifle Game. My first auction purchase. Love the sharp artwork. RANCHO Williams (USA) Montato, giocabile! Mai Prototype metal cabinet. One of my best playing games. Williams games are a favorite. Currently trying to restore Playfield with a Magic Eraser. Treading carefully as I have already wrecked one playfield. So far, so good. SPANISH EYES Williams (USA) Montato, giocabile! Mai One of my favorites. 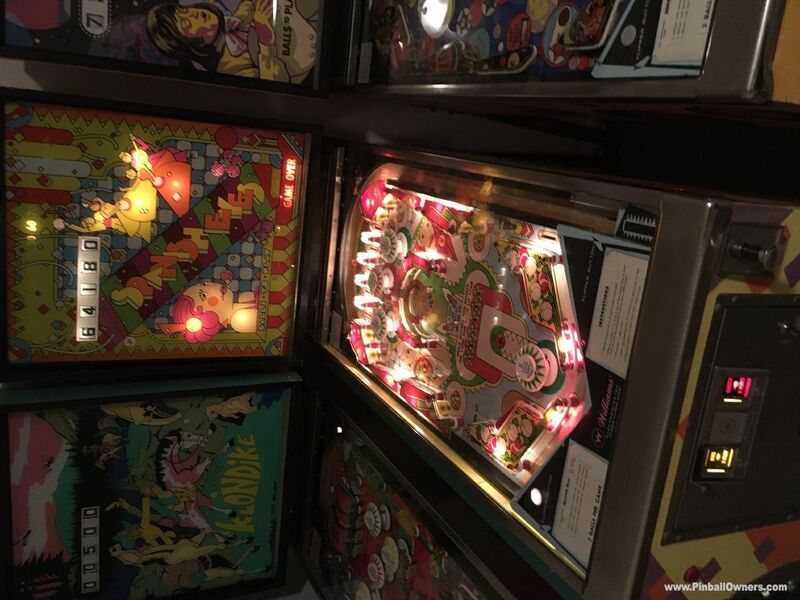 Need better playfield and backglass. I should repaint the cabinet. SUPER STAR Williams (USA) Montato, giocabile! Mai The first game I ever played. These seem to be all worn out. I spent over a year restoring what was at best not good enough for my collection. Looks great now. TOP CARD Gottlieb (USA) Montato, da riparare Mai Bought from my old neighbor. Minty old game needs to be shopped. Put a few new rings on it for a Christmas party. Will clean up great. WILD CARD Williams (USA) Montato, giocabile! Mai The operator that sold this game for retail completely stripped the coin door so it could not be routed again. What a violation. Also disabled on/off switch. Game should clean up nicely. 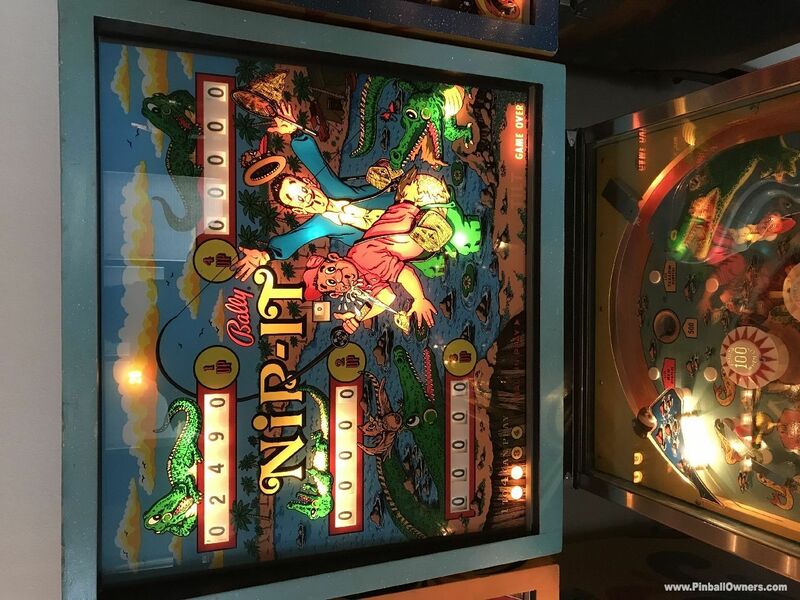 So far, the playfield is cleaning up nicely. Magic Eraser being used with caution, with excellent results. 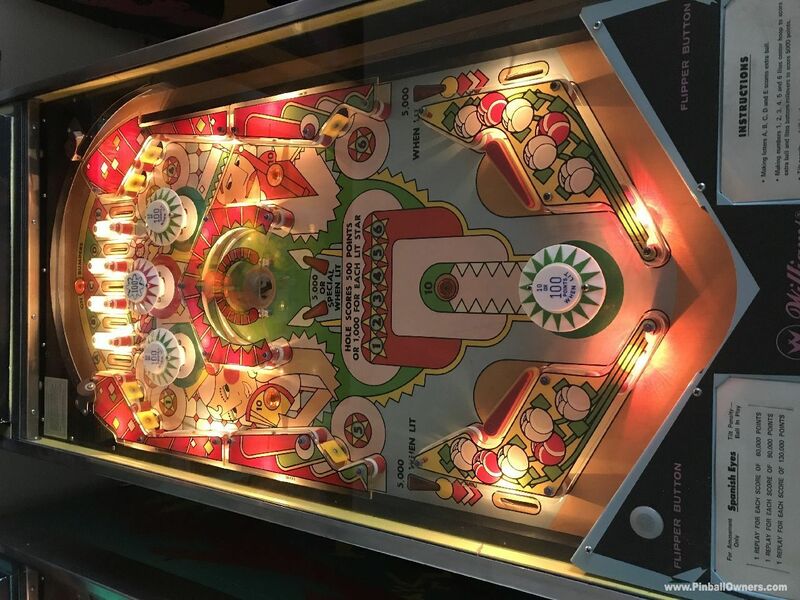 WIZARD Bally (USA) Montato, giocabile! 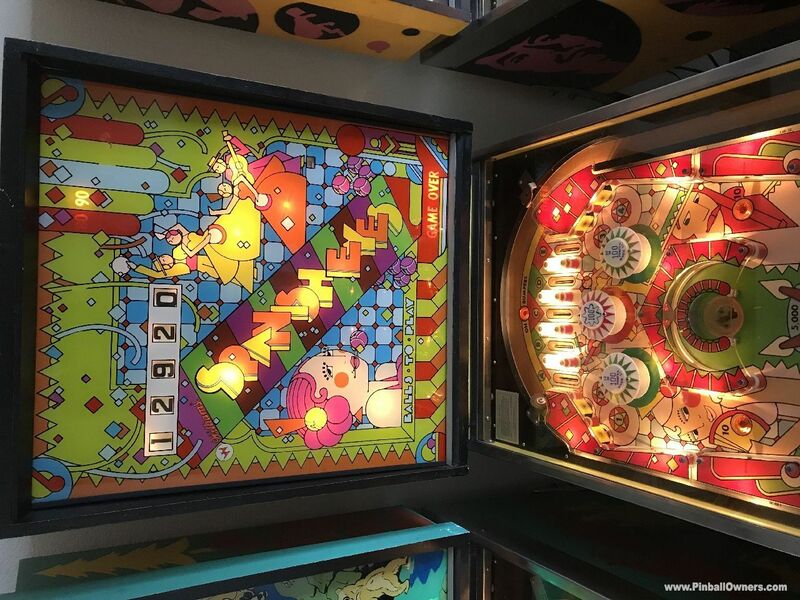 Mai Installed new Wade Krause playfield. 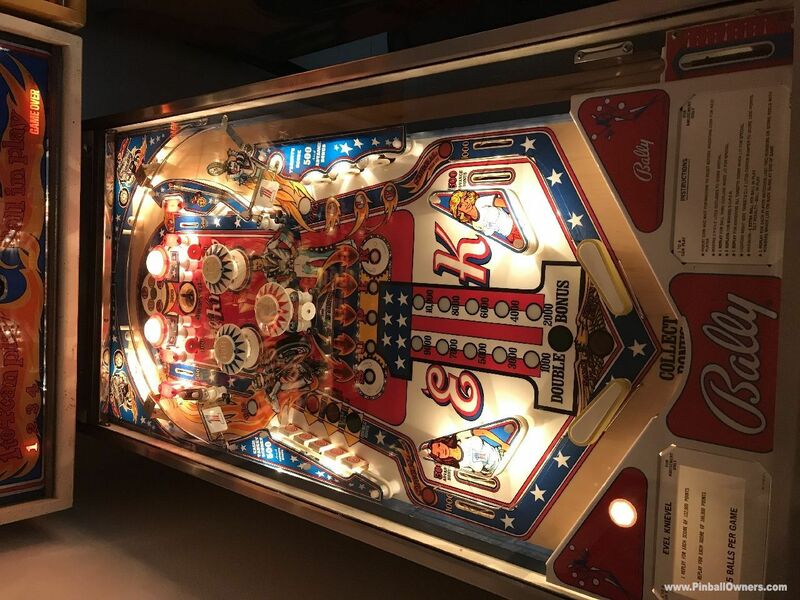 Backglass and cabinet in great shape. 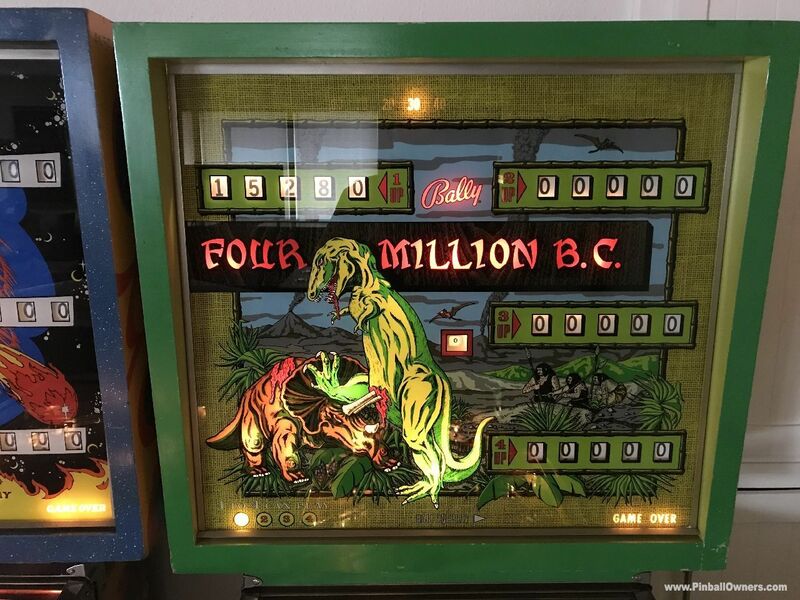 Bought reproduced back glass at Seattle pinball show. NOTA BENE: Questa pagina mostra la Collezione di Flipper da bar del Collezionista atpcfiaim da Brown's Point, WA, USA. I flipper a moneta elencati sopra e le relative immagini sono stati inseriti nel nostro database direttamente da atpcfiaim, che rimane il solo responsabile circa l'autenticità di quanto riportato. I flipper di questa pagina non sono necessariamente tutti in vendita: fate riferimento alla quarta colonna della lista per sapere se un dato flipper è disponibile per la vendita o meno. 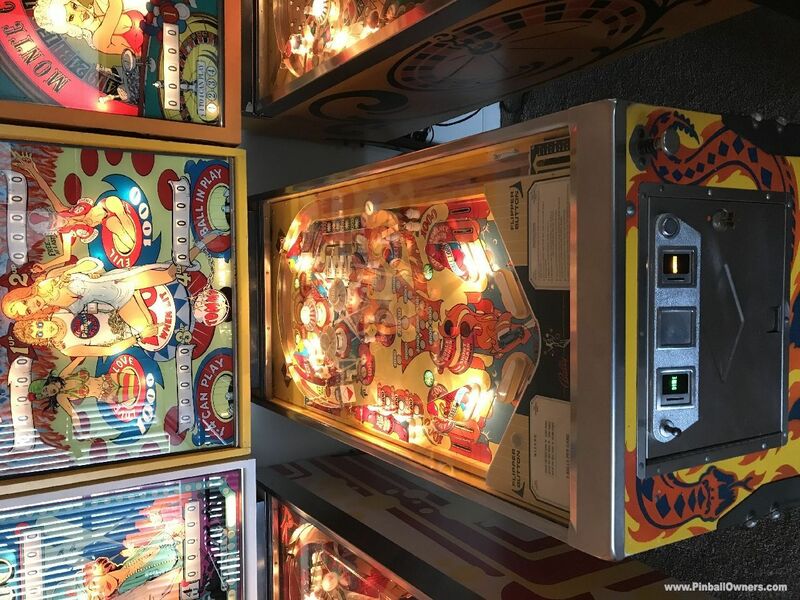 Con ogni probabilità, i flipper di atpcfiaim sono flipper usati, un tempo installati nei bar ed altri locali pubblici; il loro valore varia in riferimento alle condizioni sia estetiche che funzionali di ciascun flipper. A beautiful and well-chosen collection with some amazing rarities as Mata Hari and Evel Knievel in the EM version. 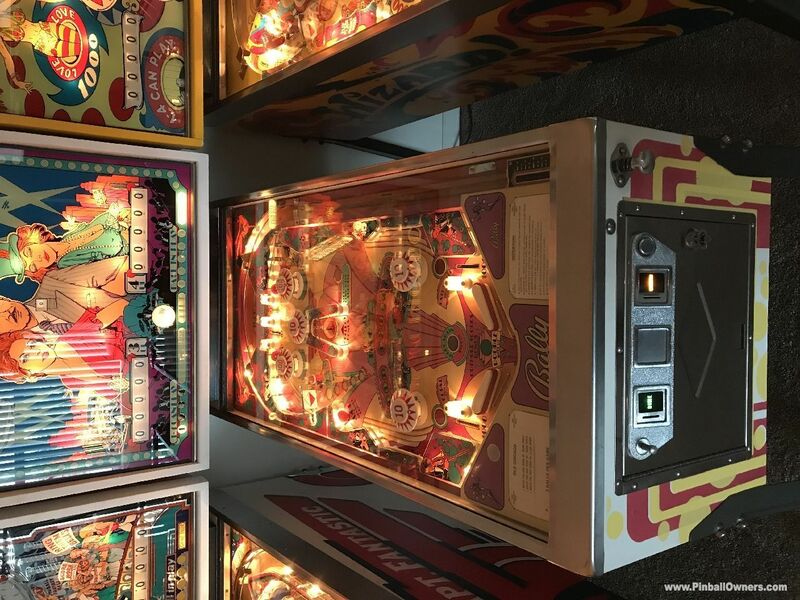 Congratulations to these beautiful pinballs! Aggiungi un tuo commento alla Collezione di atpcfiaim, che verrà mostrato a tutti i visitatori di questa pagina! Ti informiamo che non è consentito inserire link ad altri siti, indirizzi e-mail o numeri di telefono nel commento: se quello che desideri è contattare il Collezionista, usa invece questo link per inviare un messaggio privato a atpcfiaim. Ti ricordiamo anche che non siamo su eBay e questo spazio non può essere utilizzato per lasciare feedback in seguito a una transazione avvenuta tra di voi. Se userai il modulo qui sopra per inviare un messaggio privato a atpcfiaim, sappi che verrà rifiutato.